Mohammad Khan made a top score of 64 in Hartshead Moor's win. HARTSHEAD MOOR racked up a 15th win of the season as they overcame lowly Hopton Mills by seven wickets and now just require a further 32 points from their remaining five matches to clinch the Allrounder Bradford League Championship Two title. Iain Wardlaw continued his impressive form with the ball by claiming 3-32 as Mills were bowled out for 116, despite a defiant 52 from Umar Abbas. Leading run scorer Mohammad Khan ensured his team cruised to their target with 64, with Jordan Craven picking up the three Moor wickets to fall at a cost of 16 runs. Spen Victoria were dealt a blow by former player Will Smith as they suffered a six-wicket defeat at Carlton and remain bottom of the table. Smith claimed 3-40 with his off spin as Spen were bowled out for 182, with Peter Jackson (55) and captain Ollie Davison (34) leading the way. Opener Smith then made an unbeaten 90 and with support from Arman Hussain (43), eased Carlton to victory. 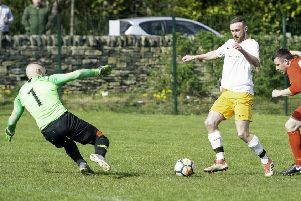 Wicketkeeper Harry Duke made an unbeaten 83 to steer second-placed Hunslet Nelson to a four-wicket win over Northowram Fields as they chased down their opponents’ score of 177. Altofts are just two points behind Nelson after a three-wicket win over Buttershaw St Paul’s. Jordan Carter made a fine 98 as Altofts overhauled the St Paul’s score of 222, that owed miuch to the contributions of Jamie Robson (63) and Jonathan Burston (62). Liversedge were dealt a blow as they suffered a two-wicket defeat to Keighley. James Rogers (5-45) and Travis Nightingale (3-0) set up the win as Liversedge were dismissed for 143 with Paul Marlow (53) and Asif Ali (43) their top scorers. Keighley were guided towards their target by Luke Chapman (41) and Australian Nightingale (33), while Steve Lane (3-27) was pick of the Liversedge bowlers. West Indian all-rounder Deron Greaves made 58 and took 3-29 as Idle defeated Brighouse by three wickets to secure their seventh win of the season.